The majority of people who are confirmed smokers and trying to give it up will tell you that they wish they had never started, or that they wish they could quit. The problem with smoking cessation is that the drug nicotine that is in the tobacco is very addictive. People have to find a way to beat the nicotine addiction. The second stop smoking problem is the physical habit it has formed. People who are trying to stop smoking do not know what to do with their hands, they do not know what to do when they take breaks at work, and they have to learn a new way of engaging with people on a social level. The great news if you are trying to quit smoking, or considering to try to quit smoking, is that many people, thousands and thousands of people have quit before you. It is a habit you can stop. 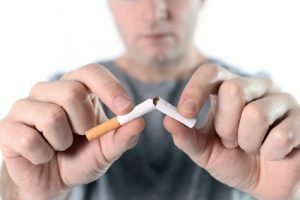 The following tips may help you to reach your goal of becoming a non-smoker. You need to set a date for your smoking cessation to begin. Try and choose a date when you will have two or more days off of work. That way you can control your environment for the first critical forty eight hours. Your support group can be made up of family, friends, or even Facebook friends. You need a group of people who can encourage and empower you. Do not choose negative minded people. Choose people who are capable of making you feel good about your efforts and accomplishments. Once you have set a date you want to prepare to quit. Following these steps will help. Clear your house of all tobacco products, ashtrays, and lighters. Buy air fresheners to help remove the lingering aroma of cigarettes from the air and furniture. Have low calorie snacks placed strategically around your house. Think about when you smoke the most often and make plans to do things differently at those times of day. If you usually smoke while watching television try crochet projects, or knitting to give your hands something to do. If you smoke right after the evening meal then get up after the meal and go take a shower. Do things that you do not associate with smoking. Make a list of reasons why you are quitting. Put a copy of this list where you can refer to it each day when you feel the urge to smoke. You do not have to stop socialising with your friends because they are smokers, but during your initial period of stopping hang out more with friends who do not smoke. Watch what they do instead of smoking and try to establish some of their habits. When you quit smoking you should pack a travel toothbrush and toothpaste with you everywhere you go. When you really feel the urge to light a cigarette, go brush your teeth instead of smoking. You should brush until the urge goes away. Typically the urge to smoke will be strong for about two minutes, and then it will begin to wane. You can also talk to your doctor about medications that are designed to help people stop smoking. Most people who smoke will tell you that coffee, alcoholic beverages like beer and wine, and tea, all seem to make cigarettes taste better. While you are trying to quit smoking increase the amount of water and juice you drink, and decrease the amount of beverages that you think make cigarettes taste better. Eat foods that have a lower fat content while you are trying to quit. Eat more fresh vegetables and fruits, and as much as possible you should eat these fruits and vegetables raw. The chewing sensation will help with the nicotine cravings. The medical experts agree that when you increase your activity you can decrease your desire to smoke. When you are trying to quit smoking, add exercise into your daily routine by starting to walk, or running, or jogging, or doing some form of physical exercise each day.